This image of Jeb Bush was captured just before he formally announced his candidacy for President of the United States. He was taking with his father - the potential Bush 45 speaking with Bush 41. What is Jeb's emotional tone in this moment? What does his body language tell us? First look at his legs. His feet are about a shoulder-width apart. Generally speaking, the wider the legs and feet are apart - the greater the confidence a person is feeling in that moment. Of course - this only goes so far and if a person has their feet too widely spaced, this effect ceases - and will look odd (as well as signal other emotions - Do you know what this indicates?). Could Jeb increase his alpha emotions if his feet were even further apart? Yes, however the degree to which he he's doing so here is consistent with the level assertiveness he needs (without over-doing it). The former Governor of Florida's back, neck and shoulders are straight and squared respectively - all consistent with high confidence. When we look the configuration of his arms, both tell us valuable information. In concert with his shoulder his right arm is held a bit away from his body. To those who are in-tune with his nonverbal cue, they will sense a physical strength from this arm position. His right hand is relaxed - indicating no anger or undue tension. His left hand and arm are busy with his mobile phone - yet there are two crucial components here which signal us Jeb's relative alpha-beta balance. The angle of his arm/elbow (to the axis of his torso if viewed from above him - as if we were looking directly down from the ceiling) is about 45 degrees. Viewed from the angle we have in this photo we see his arm is significantly elevated (although it could be and with some people the elbow matches the height of the shoulder and occasionally it moves even higher - do you know what such a configuration signifies?). With these two angles we can say that Mr. Bush's confidence is certainly high - but not too elevated. Now look at his left index finger - it's centered on the back of his phone - and not with the other fingers (that is, not on opposite side of the phone from his thumb). This shows us a relatively high alpha tone predominates in the Governor's psyche. Unlike George W. Bush, his younger brother is right handed. 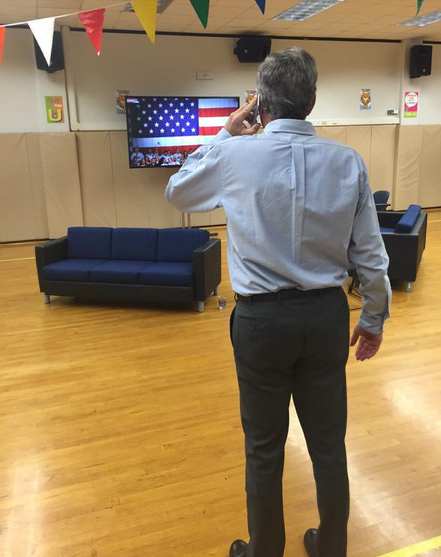 Jeb has got his cell phone in his left hand tell while speaking with his father - what does this tell you about his thought-feelings here? In summary, when we take all his body language displayed in this cluster, the moment this picture was taken, the 2016 Presidential candidate has a relatively high alpha emotional mindset - he's feeling confident and assertive at about a level of 7 or 8 on a 1-to-10 scale. Nonverbal Communication Analysis No. 3152: Hillary Clinton First Campaign Ad - "Getting Started"